We had another small dinner party and I’ve decided that I am capable of making desserts. This was ever so much easier than the Carrot Cake (no grating thumbs this time) and absolutely delicious. My s-i-l in Hawaii sent me the recipe and assured me that everyone always loved it. 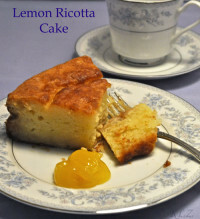 It’s very moist and very lemony and very moorish. It’s meant to serve 8…. I think it would nicely serve 12 as a dessert after dinner, and easily serve 10 as a tea or coffee treat. Add ricotta and mix well. Add almond extract, lemon zest and mix well.. 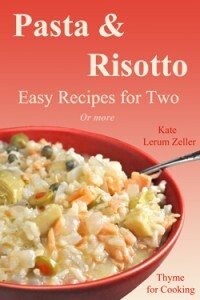 Combine dry ingredients and add to wet ingredients, stirring just until combined. Bake, 45 55 minutes, or until toothpick inserted into center comes away clean. Start testing after 45 minutes. Mine was done at 45 minutes. Remove and cool for at least 15 minutes, then remove from pan and allow to cool completely. Whisk lemon juice and powdered sugar. Drizzle over cake and allow to dry / soak in for at least 30 minutes. I had a bit of lemon curd on hand…. Gilding the lily, I know, but I love lemon. I had / have great hopes for my little lemon tree. I planted it at the beginning of August. It’s now 3 months old. Not exactly shooting up, is it…. It is getting a new leaf. I’ve been very careful with it – but every time I put it out on the balcony to be in the sun, something chewed on it. I’d put it in a sunny window but we don’t have a sunny window. The sun shines in the kitchen in the summer but not in the winter. The rest of the windows are well-protected by trees. So I bought a grow light. Mon mari hung it up for me today. There was a bit of discussion about the grow light…. Apparently, back in the beginning of time, he bought a grow light…. And it was big and expensive and ugly. 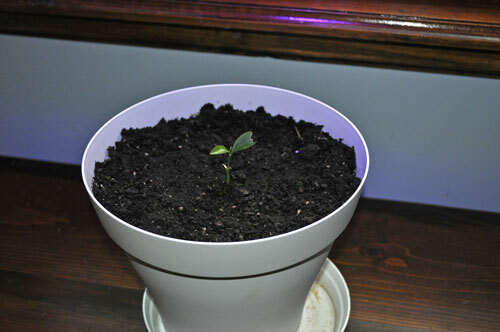 He wasn’t enthusiastic about having a big, ugly (and expensive) grow light in the house for the teeny tiny lemon tree. The first one I found online was huge and sold for 600 euros. I started to think my plan may have a flaw. I looked further (Amazon UK). I found light bulbs for 5 euros each. Of course I still needed something to screw it in to…. You know, connected to a cord that plugs into the power and all that bit. Mon mari came through again…. I told him he could put some of his geraniums next to my lemon tree. Oh…. 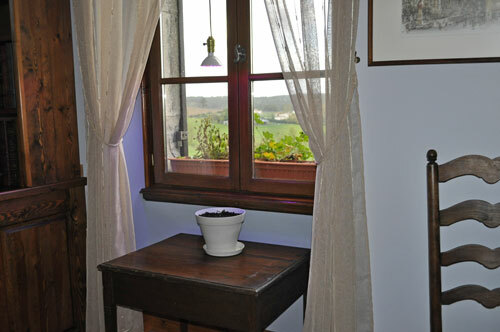 The lemon tree is sitting on a table my father made for me years ago when I first lived on my own. 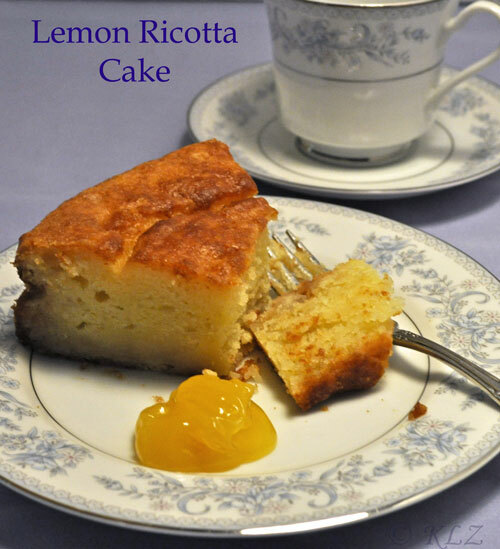 Lovely cake Katie – I love anything about lemons. Good luck with your tree! Where did you get your lemon seed? From a lemon you ate? How did you know it was ripe enough to plant? I’ll be interested to hear how it progresses. Love your Dad’s table! I’m so happy you liked the cake. Its a keeper recipe for us. 2 leaves on your tree, yeah! Ina, thanks… it’s growing sooooo slowly. Pam, my s-i-l sent it to me Beyond that, I’m clueless. I planted 5 and one sprouted…. don’t know how or why, just happy it did. Phoenicia, it really was a hit… we all loved it… Thanks heaps and hugs back.